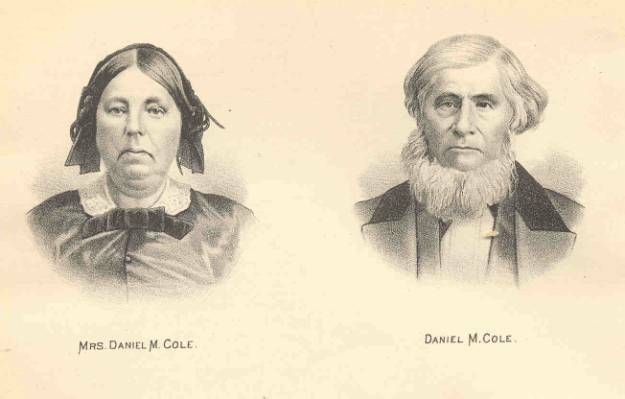 Daniel & Polly (Bemis) Cole. This town embraces all of township 5 in sixth range, except three tiers of lots on the south side, and that portion of township 6 in the sixth and seventh ranges, east of Connoirtoirauley Creek, and south of Cattaraugus Creek. The northern boundary is Cattaraugus Creek, which separates it from Erie County. On the east it is bounded by Yorkshire and Machias; south by Ellicottville and East Otto; and west by the last-named town, from which it is separated in part by Connoirtoirauley Creek. It is nearly the centre border town of the county, and is drained by Cattaraugus Creek, and Buttermilk and Connoirtoirauley Creeks, which are its tributaries, and flow in a northwesterly direction. In the southern portion of the town the hills extend in ridges in a northerly and southerly direction, and attain an altitude of about 300 feet. From many of these elevations the waters of Lake Erie are plainly visible. It was not until 1816 that any portion of the domain now included in the town of Ashford was contracted to actual settlers, but during that year, contracts were issued by the Holland Land Company to William and George SHULTIS, of Claverack, Columbia Co., N. Y., Andrew FRANK and David OYER, of Herkimer County, N. Y., and Benjamin RHODES and Marsena BROOKS. From this time the settlement of the town commenced and immigration was rapid. Henry FRANK, a native of Philadelphia, of German descent, was one of the first settlers in the town of Frankfort, Herkimer Co., and in this year came in with his wife and two sons, Andrew and Jacob H., with their wives. Andrew contracted for 100 acres on lot 56. 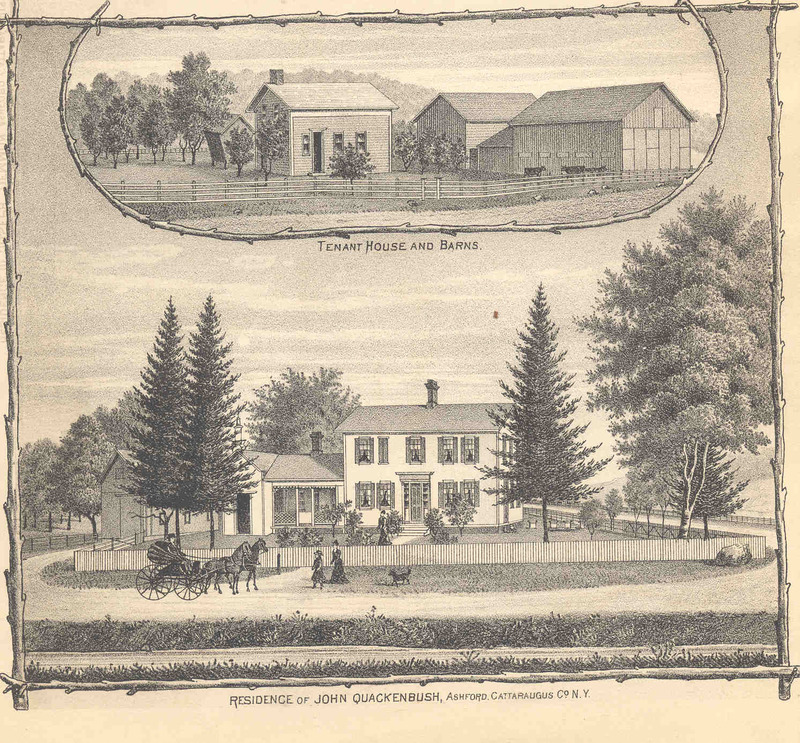 In 1817, Jacob contracted for 100 acres on lot 71, afterwards known as the NEWKIRK farm. Henry FRANK, the father, was a scout in the Revolutionary army. Andrew was a soldier in the war of 1812. In his family occurred the first death in the town, that of a daughter, Phebe, Aug. 30, 1818. In the family of Jacob H. FRANK, the first child was born, a daughter, Elizabeth, in 1817. The descendants of these FRANK brothers are living in the town and are numerous. William and George SHULTIS, from Columbia County, took possession of their lands, on lot 36, where Russel COSTER now lives. On this farm was an old beaver-dam. About thirty acres were without timber. They here built a log house, and cut a wide slashing entirely around this open space, but soon removed to the north side of Cattaraugus Creek. The log house was used for many years as a stopping place for travelers on the road. The SHULTIS brothers took the contract for opening the road for the Holland Company, that was in the early years known as the "Shultis Road," which extended from Springville to Cattaraugus Creek, on lot 65 and through lots 65, 58, 51, corner of 50, 43, 42, 16, 15, 14, 21, 29, and 36, when it entered the town of Ellicottville, through which it passed to the village of Ellicottville. This road was opened about 1818, was but little used, and entirely abandoned in later years, following, however, nearly the route of the present road through the eastern part of the town. Marsena BROOKS, from Hampden County, did not settle in the town until about 1822. He remained till about 1829, when he removed to Ellicottville, and from thence to Ohio. Benjamin RHODES soon settled, lived in the town until a few years since, when he removed to Springville and lived with his daughter. David OYER married Mary, a daughter of Andrew FRANK, located land in 1816, but did not settle until 1819, when he came in, traveling the last eight miles through the wilderness from Springville, and took possession, with his wife and two children, Peter and Elizabeth, of lot 56, where Andrew P. FRANK now lives, and built the first saw-mill in town, on Connoirtoirauley Creek, in 1826, near where Peter ELLIS lives. He was elected one of the first commissioners of highways and overseers of the poor, in 1824, and was supervisor in 1830-31. Augustus VAN SLYKE, from Herkimer County, married a daughter of Andrew FRANK, and came to this town in 1819, with his wife and two children, and settled on lot 47. He was instrumental in the organization of the first church in town, which was the Baptist. No descendants are now living in Ashford. Nathan SAUNDERS, a native of Massachusetts, emigrated to Springville in 1816, and located 100 acres in this town, on lot 70, where James GOODEMOTE lives, and in 1818, with oxen and sleds, moved his wife, seven children, and household goods, built a large log house and barn, Lothrop BEEBE and others coming out from Springville to assist him in rolling up the logs. He was one of the first overseers of the poor in 1824. James, a son, soon after located 100 acres on lot 60. John GOODEMOTE, of Kinderhook, Columbia Co., emigrated to this town and settled on lot 60, where Charles C. BIGELOW lives. Baltus, his son, settled on lot 65. Philip also owned land on lot 65, but settled on 60. It is related of John GOODEMOTE that, in conversation with Nathan SAUNDERS concerning the education and well-being of the children, he said, "Mr. SAUNDERS, ve must puilt school-house for de Childers, You oppinate me for drustee. I oppinate you, Den ve puilt de school-house and have de monies,"
Peter QUACKENBUSH from Montgomery County, emigrated with his wife and son; John (who is still living, and resides in Ashford Hollow), in the fall of 1819, and located 150 acres on lot 55, where Isaac BELLOWS now owns. 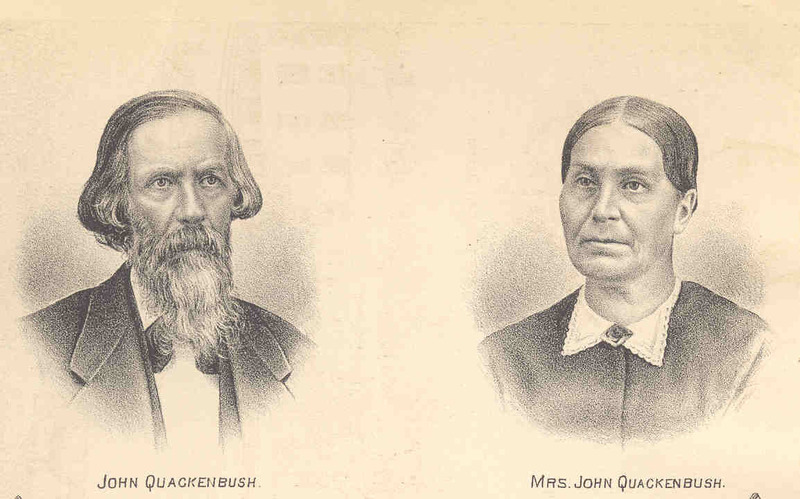 John H. QUACKENBUSH, his father, came in 1821, and built the first tavern in town, on his son's farm. He was in the Revolutionary war, captured with his brother, David, by the Indians, and was taken west as far as Niagara, where they were exchanged and released. While in captivity they were compelled to run the gauntlet. Jacob HUFSTATER, of Herkimer County, located land, in 1818, on lot 1, township 6, range 7, where he lived in 1824. Afterwards located on lot 75, in 1820. In 1825, he sold out to Henry FRANK, the oldest son of Henry FRANK, Sr., and bought on lot 78, where his son, Jeremiah, now lives. Michael HUFSTATER, a brother of Jacob, settled on lot 75, but did not remain long. Michael C. HUFSTATER, in 1821, came in town and settled, lived here six years, returned to Herkimer County, and after a few years returned to the eastern part of the town and settled. John HOLDRIDGE, Elijah PARMENTER, and Tristam DODGE were located on lot 53, and Asahel NYE, on lot 54, in 1819, and were there many years. Austin PRATT, who married the daughter of John BEVERLY, in 1823, of Otto, was on lot 45, with Elias BOWER, in 1824. Philip BONESTEEL and his son, Henry, settled in this town before 1820, where Nelson HUFSTATER now lives. He was chairman of a special town-meeting, April 27, 1821, at the village of Ellicottville, and was justice of the peace. In 1823 they removed to East Otto. Isaac WOODRUFF settled on lot 53 in 1820, and, was one of the first assessors of the town. Anderson ROWLAND, in 1819, settled on lot 61 or 55, where ___ JOHNSON now lives. Joseph T. and Norman B. CARTER, from Darien, Genesee Co., N. Y., in the month of March, 1821, came to this town and located a quarter section of lot 45, cleared off land, and kept bachelors' hall many years. Norman B. built the first frame barn in the town, in 1823, where Geo. QUACKENBUSH now resides. He was elected one of the first school commissioners, and was justice of the peace in 1834. The first schools were taught in the town in the winter of 1832-23. Norman B. CARTER teaching in the southern part of the town in a log school-house on lot 56, where Andrew NEFF lives; Daniel THOMAS, at "Thomas' Settlement," in the northern part. In 1835, Joseph T. and Norman B. removed to Michigan. Russel M. CARTER came in the summer of 1822 to visit his brothers. In 1825 he returned and worked all summer, and located part of lot 45, and later, bought on lot 36, where he still resides, being the farm originally settled by Wm. and Geo. SHULTIS in 1818. Jacob P. BARGY, from Herkimer County, was at Sackett's Harbor in the war of 1812, and was poisoned by water from the wells in that place, with other soldiers. In 1810 he married Dorothy Ann FRANK, a daughter of Henry FRANK, Sr., in the village of Herkimer, and came to this town in 1824, worked on shares the farm of David OYER, and afterwards bought on lot 62. In 1830 he was elected justice of the peace. Seth ALLEN came in the town in the winter of 1822-23, and built the first grocery-store in the town at Ashford Hollow, near the creek, where James HUGHEY lives. He also built a log ashery by the bridge, and manufactured pearlash. He afterwards purchased land on lots 68, 69, 73, and lived on lot 74; married Polly, the daughter of John GOODEMOTE. He was elected the first town clerk and justice of the peace in 1832-36. Jacob FRANK, son of Henry FRANK, Jr., settled on lot 48 in 1821, the 1st of April, and in that year worked at his trade as a blacksmith, opening the first shop in town. His son lives in Ashford Hollow. Frederick FRANK, also a son of Henry FRANK, Jr., owned land on lot 8, township 6, range 7, in 1824, and settled on lot 75, and is still living in the town. Henry, his father, came in the next year, and bought out Jacob HUFSTATER. John D. QUACKENBUSH, from Montgomery County in 1824, settled on lot 54, which James NEFF now owns. He purchased 100 acres for $2.00 per acre, of the Holland Land Co. The journey to this place occupied eleven days. He built a log house with two openings, one on each side. He packed an old trunk with provisions and clothing on leaving home, which served him also for a table. His son, Peter QUACKENBUSH, lives on the GOSPEL lot. Peter SAMPSON was a native of Massachusetts, emigrated to the north side of Cattaraugus Creek, with his wife and a large family of grown-up sons and daughters. Sanford J. SAMPSON had located land on lot 29, township 5, range 6, in 1822. In that year, Peter, his father, traded farms with John GOODEMOTE, who lived across the creek on lot 60, and came over on this side, and Gamaliel settled near him. Peter was elected commissioner of highways in 1824, supervisor in 1825, again in 1832-33, and afterwards justice of the peace. He early carried the mail from Buffalo to Olean, first on foot then on horseback, and finally by stage, and continued this position as mail-carrier and expressman until his death, which occurred Dec. 8, 1836, aged sixty years, and was caused by an accident in descending a hill near the Cattaraugus breakers. His daughters married Wm. SHULTIS, Royal McLEAN, Charles C. BIGELOW, and Truman BEASLEY. Griffin and David WILDEY, natives of Columbia County, settled near East Ashford in 1821; in 1822 he owned on lot 57, now in East Otto. Griffin was on lot 57. He assisted in clearing the spot where the jail in Ellicottville was built. David settled on lot 58. Amos and Daniel THOMAS settled on lots 58 and 59 in 1822, on what is known as "Thomas' Corners." The first school-house in town was built here, and Daniel THOMAS was the teacher, school being taught the same winter in the south part by N. B. CARTER. Daniel was school commissioner in that year. Amos THOMAS lived where Emory BOND lives; the first town-meeting was held at his house. In 1822, Ebenezer C. SHERMAN, of Vermont, located first 150 acres on lot 57; he was one of the first assessors, afterwards town clerk. George ARNOLD settled early, and was a school commissioner in 1824, with N. B. CARTER and D. THOMAS. Jeremiah WILCOX settled on lot 70 before 1824. He was supervisor in 1834-36. Timothy STEVENS, a native of Massachusetts, emigrated to Pike, Allegany Co., in 1823; to this town with his wife and five children, locating 125 acres on lot 57, in 1825, where he remained a year or two, then settled on lot 51. His sons, Freeman, Andrew, and Thomas, settled in the town, the two latter living in East Ashford. James FLAGG and Amos B. FULLER settled on lot 54, on Cattaraugus Creek, before 1825. Job BIGELOW, from Vermont, and John BOND, from Massachusetts, settled in 1825. BIGELOW on lot 47, where his son Oliver lives. BOND, in the fall of that year, settled on lot 70, where Paul COOK lives. He located on the bend of the creek, but lived up on the breakers. J. P. BOND, his son, settled on lot 59. Alexander SCOBEY came from Herkimer County, and settled, about 1822, on lot 6, East Otto, about one mile west of Dutch Hollow; was there seven years, and went to Ashford and bought the grist-mills of Peabody, which were two and a half miles southwest from Springville, and remained there thirty-five years, during which time he was supervisor of the town in 1848, and from 1850 to 1853. Rebuilt the grist-mill and saw-mill dam, and sold to Loveland & Daggets in 1864. He also built a bridge 185 feet in length, across the Cattaraugus Creek at that point, in 1862. He is now a resident of Sandusky, in the town of Freedom, and is seventy-two years of age. David R. UPON located on lot 39; Daniel M. COLE, of Vermont, located 100 acres on lot 46, and settled upon it the 16th day of November, 1826; Freeborn JOSLYN on lot 46, where Ezra BIGELOW now lives; Elder PROPER on lot 44, where Emerson WILTSIE lives. These settled between 1825 and 1828. The two tiers of lots on the east side of the town, except on Cattaraugus Creek, were entirely unoccupied before 1825. Between 1828 and 1830, Solomon DAY, from Vermont, settled 100 acres on lot 36, where Philip WILTSIE; his son-in-law now resides. His daughter, Mrs. WILTSIE, and son, Hodson DAY, are living in the town. Albert WILLIAMS settled on lot 35, where his son, R. C. WILLIAMS, now resides. In 1830, Nathaniel HOLLAND settled on lot 49; his son Norman on the flat by the creek. Wm. RICE also settled on lot 49, where the saw-mill at East Ashford now is. He built a saw-mill on the creek about the time he came in. The settlement has long been known as Riceville, in honor of him. Cyrus BELKNAP and John WILSON sold their lots on 48 and 50, about 1829, to Abel RICE, a brother of William. On the hill southeast from East Ashford, Charles BOND, Freeman STEVENS, and Sullivan BOND purchased 200 or 300 acres on lot 16 in about 1832. Lothrop BEEBE came to Springville in 1816. As early as 1823 he was liable to jury duty in this town, having land at that time on lot 14, known as the "Beebe Lot," where West Valley now is, being the first to locate land in that part of the town. But, did not settle on it, being then a bachelor in search of a wife, -- a search which occupied six years, but which, as he says, proved to have been time well spent, in view of the excellence of the helpmeet he found. He finally settled, in 1837, in the northeast corner of the town, on lot 41. Alden HYDE, John W. CROSBY, and Chauncy POND were all located on or near the creek at that time. Abel HOLMAN and Lewis TRACY were below on the creek. Johnson, Truman, and David BENSLEY were in the town in 1822, and settled on lot 74. Johnson BENSLEY was the first supervisor of the town. Truman BENSLEY was one of the first assessors. Truman CRUMMELL, about 1826, settled on the same lot with Jacob HUFSTATER. William WAIT, of Washington County, in 1810, came to Genesee with his wife and three children, settled there until 1830, when he went to Ellicottville and took up 120 acres on lot 21, and 120 acres on lot 22, -- the east side of both lots, -- they being situated in what is now West Valley. There was no house or even shanty. Three miles north, at Riceville, a little settlement had been started. Lorenzo and Esek WAIT, sons of William, with a team of horses, a yoke of oxen, and their household goods, drove the first team through from Riceville to that place. By chopping trees, rolling logs, and bridging streams with brush, they finally arrived and took possession, and immediately commenced building a shanty first, on lot 22, by rolling logs 12 feet high on one side and 8 feet on the other, roofing it with elm-bark cut 4 feet long, lapping the edges. In the corner a pile of hemlock-brush was laid, on which their beds were placed. After getting a habitation, they commenced chopping, and soon made a good garden. The family, consisting of Mr. and Mrs. WAIT, and Fanny, a daughter, came in, arriving at the home the 3d day of May, 1830. The shanty was 12 by 18 feet, and cooking for a time was done on the ground in a corner of the cabin, a piece of bark having been taken out at the top to let the smoke out. After the garden was made and the family settled in the new home, Esek went out in the ravines and drew in fiat stones, and Lorenzo and his father laid up a large chimney, 8 feet square at the bottom, having one fireplace in the cabin, a hole having been cut through, and another fireplace outside. In 1832 a log house was built, 18 feet by 20 feet and 16 feet high, adjoining the shanty and inclosing the other fireplace. The next family that came in was Samuel HANAN, from the west part of Ashford, where he had been for several years. He settled, in June, 1832, on a part of lot 13, locating 50 acres on the creek, where he built the first sawmill in that part of the town. Riley GARFIELD, in the fall of 1832, located 120 acres on the south part of lot 14, and sold out in a few years. The property belongs mostly to John LINK. John, Ormill, and Royal MURPHY, three brothers, located in 1830, and moved in November, 1831. They took up about 200 acres on lots 15 and 16. John stayed a few years, and moved to Pennsylvania. Ormill lived here until about 1868, when he moved to Machias. His son John remained at West Valley, where he is justice of the peace. Eli K. PICKETT, from Genesee County, in the fall of 1834, came in and took up 150 acres on the south side of lot 13. Lorenzo WAIT took the 120 acres on lot 21, afterwards sold to William GIBSON in 1838. Joseph WEST and Wm. GIBSON, both from Genesee County, came in about 1838. WEST purchased 120 acres of Apollos LINCOLN, who was a son-in-law of William WAIT, and had put up a cabin on lot 37. Joseph WEST has two sons, George N. and James, who are both living at West Valley. George N. WEST has represented the county in the Assembly and the town as supervisor. In the year 1819, John HOLDRIDGE, Elijah PARMENTER, and Tristam DODGE were living upon farms on lot 53, township 6, range 7, and Asahel NYE had taken lands in lot 54 of the same township; these locations being within the northwest corner of Ashford, then a part of Otto. From a map of the town of Ashford, made in 1843, the following occupants were on the several lots. In the southeast corner lots 4, 5, 6, 12, 20, 28, 30 were marked nonresident. Of lot 29, 148 acres were on the north side, marked N. R., and the remainder was taken by B. B. CLOVER, Jonathan WEST, and Geo. and Joseph WEST. About 120 acres on the east side of lot 21 was taken by Wm. GIBSON. About the same amount on the east side of lot 22 by Wm. WAIT and P. BARLOW. Lot 14 was taken by Hiram CHAMBERLAIN, Joel BAILEY, and John LOCKROW; lot 13 by S. R. HANAN, R. HANAN, W. MASON, Wm. GIBSON, S. PICKET, and Eli K. PICKET, lot 7 on the east line of the town, 100 acres on the east was taken by S. COX, 106 acres by B. HADLEY, 68 acres, N. R., and 50 acres by H. DAVIS; lot 8, directly north, "marked N. R.;" lot 15 is marked to O. MURPHY, Ezra COOPER, and H. WILLIS; lot 16 to Charles BOND and B. MURPHY, except 80 acres, marked N. R.; lot 23 is marked to E. WILLSON and Wm. NEHEMIAH, except 128 acres on the north side, marked N. R.; lot 24 is 262 acres, marked N. R., and 25 acres to Wm. M. RICE; lot 31 is 314 acres N. R., and 50 acres to Roswell HILL; lot 32, Conrad WIDRIG had 100 acres on south side, the remainder N. R.; lot 36 to George HUGHEY, Thomas HICKS, Cornelius HESSEN, and Wm. HESSEN; lot 37, 107 acres N. R., Charles FACET, B. B. CHAMBERLIN, and N. HEWSON the remainder; lot 38 and 40 N. R.; lot 39 N. R., except 50 acres to J. P. BARGY; lot 44, Gospel Lot, 50 acres, Daniel B. JEWETT and Isaac WOODRUFF; lot 45, Wm. HICKS, J. P. BARGY, R. A. CARTER, P. QUACKENBUSH, D. B. JEWETT, and Catharine STANING; lot 46, J. P. BARRY and John BELLOWS; lot 47, J. P. BARGY, J. H. FRANK, John COLF, and John PANAPS; lot 48, A. ALLEN, J. KETCH, D. OYER, and 145 acres N. R.; lot 52, D. B. JEWETT and others; lot 53, D. B. JEWETT, Isaac WOODRUFF, and Paran FOX; lot 54, Andrew FRANK, John D. QUACKENBUSH, I. WOODRUFF, and A. J. STORRING; lot 55, J. ROWLAND, J. BELLOWS, Widow OYER, Asa ROWLAND, David OYER, and D. HUFSTATER; lot 56, David HUFSTATER, Wm. MIMMICK, H. FRANKS, and John ROWLAND; lot 60, Arnold HOLDEN 150 acres, and 140 acres N. R.; lot 61, Hiram FOLTZ, John VAN SLYKE, M. HILLER, and J. WARNER; lot 62, Joseph FOLTZ, C. BOSS, D. OYER, and A. FRANK; lot 63, D. OYER, J. ANDERSON, C. TURNER, J. MULTER and J. FRANK; lot 64, J. MULTER, Geo. BREEDENBECKER, Jeremiah FRANK, and Warren FRANK. Township 6, Range 6. -- Lots 55 and 67 are N. R.; lot 35, A. WILLIAMS, D. DAY, J. FLAGG, 116 acres, N. R.; lot 36, Orrin FRENCH, S. LAWTON, S. M. DAY, and G. LEONARD; lot 37, Sands MOON, E. PALMER, Robert HOLDEN, S. VAUGHAN, and 39 acres N. R.; lot 38, Ebenezer POOL, B. JOSLYN, W. MOON, J. JOSLYN, and 129 acres N. R.; lot 39, Ambrose UPSON, E. POOL, D. K. UPSON, Peter PECK, and 71 acres N. R.; lot 40, Abel HOLMAN, 100 acres, and 270 acres N. R.; lot 41, Jonathan STUDLEY, Wm. BELL, Lothrop BEEBE, John W. CROWLEY, Geo. RICHMOND, and M. HYDE; lot 42, Wm. M. RICE, S. BOND, F. HAMMOND, and 33 acres N. R.; lot 43, S. REMINGTON, Russel FRENCH, and A. RICE; lot 44, Peter P. WILTSE, Chester WILDER, H. F. WILDER, and Samuel FAIRBANKS; lot 45, Abel DENNISON, Edmund DENNISON, Cornelius BIGELOW, and 100 acres N. R.; lot 46, C. C. BIGELOW, Job BIGELOW, Ezra BIGELOW, C. STOWEL, 49 acres N. R.; lot 47, Job BIGELOW, Almon FULLER, and 75 acres N. R.; lot 48, L. TRACY, O. TRACY, Elias BREWER, Laban GATES, and 100 acres N. R.; lot 49, N. HOLLAND, Wm. M. RICE, and 157 acres N. R.; lot 50, A. RICE, A. HADLEY, and 53 acres N. R.; lot 51, Timothy STEVENS, Thomas STEVENS, J. REMINGTON, J. D. SEARL, and 72 acres N. R.; lot 52, J. SAUNDERS, O. MORTON, B. WEAST, Wm. HOLMAN, James KINGSLEY, 64 acres N. R.; lot 53, Daniel M. COLE, Wm. SHULTZE, Wm. GOODEMOTE, H. HITCHCOCK; lot 54, Almon FULLER, Richmond FULLER, J. S. DOUGLASS, J. KINGSLEY, A. M. D. FULLER, A. B. FULLER, J. G. FULLER, and 40 acres N. R.; lot 56; A. HADLEY, 25 acres, R. TYLER, 100 acres, and 229 acres N. R.; lot 57, E. C. SHERMAN, C. SHERMAN, Wm. L. EMERSON, and 142 acres N. R.; lot 58, George WASSON, Conrad WEAST, E. FAY, and J. WILCOX; lot 59, J. C. JACKSON, Amos L. THOMAS; lot 60, James SAUNDERS, N. HITCHCOCK, Truman BENSLEY, H. HOUSE, and 124 acres N. R.; lot 61, John LAMBMAN, 100 acres, and 270 acres N. R. ; lot 62, John FRANK, 100 acres, and 260 acres N. R. ; lot 63, Jacob WHITE, Joseph SAUNDERS, 198 acres N. R. ; lot 64, James SAUNDERS, J. P. BOND, and 262 acres N. R.; lot 65, C. C. BIGELOW, S. FRITTS, G. WADDELL, Baltus GOODEMOTE, Philip GOODEMOTE, James D. SEARL; lot 66, John JOHNSTON, 100 acres, and 263 acres N. R.; lot 68, Peter WIDRIG, Seth ALLEN, and 186 acres N. R.; lot 69, Seth ALLEN and J. P. BOND; lot 70, Jeremiah WILCOX, Bond COOK, and Widow OTIS; lot 71, W. FRANK, W. DEDRICK, Francis NEWKIRK, Uriah WIGHTMAN, and Lee WIGHTMAN ; lot 72, Timothy FOLTS, 50 acres, and 340 acres N. R.; lot 73, Seth ALLEN, J. HUFSTATER, and Peter WIDRIG; lot 74, Seth ALLEN, George WIDRIG, Elbert W. COOK, S. SMITH; lot 75, John P. OYER, Daniel FRANK, Frederick FRANK; lot 76, Frederick FRANK, Henry FOLTS, H. MILLER; lot 77, John PRATT, Nathan PRATT, and ___ DOW; lot 78, J. HUFSTATER, Truman CRUMMELL. Township 5, Range 7. -- Lot 8, Henry FRANK, F. FRANK. Township 6, Range 7. -- Lot 1, John D. OYER, Frederick FRANK, 100 acres N. R.; lot 10, A. WOODRUFF, John MILLER, J. P. OYER, 121 acres N. R.; lot 11, N. R.; lot 25, George OYER, John DOW, Daniel DOW, L. WEBER; lot 26, John Lowe, J. J. FRANK, H. WIDRIG, G. G. WIDRIG, 47 acres N. R.; lot 27, G. G. WIDRIG, and 119 acres N. R.; lot 39, I. J. WEBER, B. WARNER, Widow PIERCE; lot 40, L. and M. WEBER and C. Crawford; lot 53, A. SCOBEY, F. SMITH, O. PARMENTER, M. C. HUFSTATER; lot 54, Wm. OYER, L. WEBER; lot 55, Matthew WEBER, B. B. WEBER, L. PIERCE, J. B. ROBBINS, and S. PIERCE; lot 41, T. PIERCE, Robert DYGERT; lot 42, Willard HAKES and Jacob HELMSTREET; lot 43, J. DODGE, Jesse FRYE, and 61 acres N. R.; lot 44, 59 acres N. R.; lot 45, J. S. FRYE. 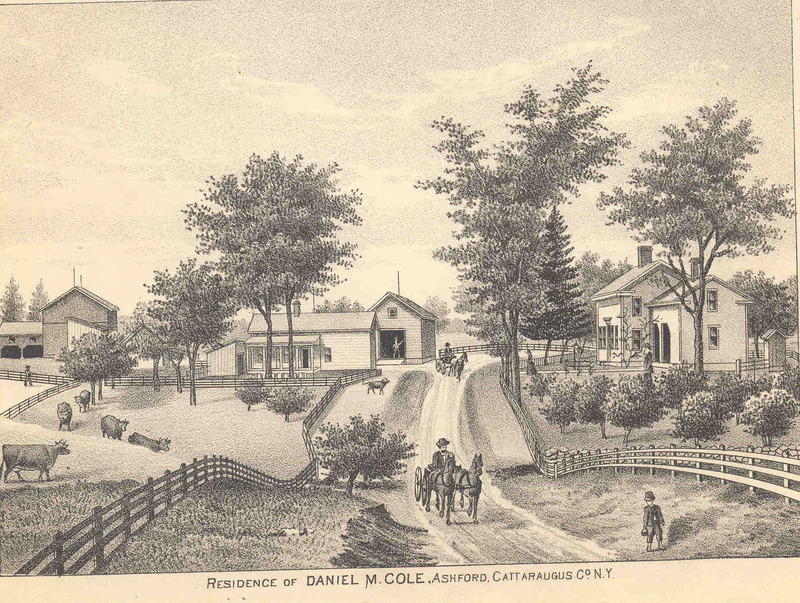 Ashford was erected from Ellicottville, Feb. 16, 1824. A part of Otto was annexed April 13, 1835. The first town-meeting was held at the house of Amos L. THOMAS the first Tuesday in March, 1824, and organization was perfected. The following officers were elected: Johnson BENSLEY, Supervisor; Seth ALLEN, Town Clerk; Ebenezer C. SHERMAN, Truman BENSLEY, and Isaac WOODRUFF, Assessors; Avery SMITH, David OYER, and Peter SAMPSON, Commissioners of Highways; Nathan SAUNDERS and David OYER, Overseers of Poor; Norman B. CARTER, George ARNOLD, and Daniel THOMAS, Commissioners of Schools. 1825-29. Peter SAMPSON. 1856. Joseph HAMMOND. 1830-31. David OYER. 1858-60. Boutelle A. LOWE. 1832-33. Peter SAMPSON. 1861-62. Francis P. RICE. 1834-36. Jeremiah WILCOX. 1863. Boutelle A. LOWE. 1837. David RUPSON. 1864-65. Francis P. RICE. 1838. Jeremiah WILCOX. 1866. A. B. WILLSON. 1839-40. David B. JEWETT. 1867-68. Geo. N. WEST. 1841. David PIERCE. 1869. Andrew B. NEFF. 1842. Thomas PIERCE,Jr. 1870. John QUACKENBUSH. 1843-45. David B. JEWETT. 1871. Andrew B. NEFF. 1846-47. J. J. FRANK. 1872-73. F. P. RICE. 1848. Alexander SCOBEY. 1874. Geo. W. OYER. 1849. Alanson KING. 1875-76. Andrew B. NEFF. 1850-53. Alex. SCOBEY. 1877. Geo. N. WEST. 1854-55. A. B. WILLSON. 1878. A. C. PORTER. 1825-27. Charles BOSS. 1856. John MULTER. 1828. George ARNOLD. 1857. James J. BARGER. 1829-30. Ebenezer C. SHERMAN. 1858. Francis J. KINE. 1831. James D. SEARL. 1859. F. P. RICE. 1832. Abel FRENCH. 1860: Alonzo WILTZE. 1833. John W. CLARKE. 1861. John ELLIS. 1834-37. Charles BOSS. 1862. Seward ROBBINS. 1838. Harry HOUSE. 1863. Alonzo WILTZE. 1839. James D. SEARL. 1864-65. Frederick A. CLARK. 1840-41. Charles BOSS. 1866. J. B. LARABEE. 1842-45. Seth ALLEN. 1867-68. Charles N. SHERMAN. 1846. Warner FRANK. 1869-70. George W. OYER. 1847. Jeremiah FRANK. 1871-72. F. P. RICE. 1849-51. David WARD. 1873. Charles F. BALLOU. 1852. Francis P. RICE. 1874. Clark K. DAY. 1853. John REED. 1875-76. Charles HOLDEN. 1854. Francis P. RICE. 1877-78. William KRUSE. 1830. Jacob P: BARGA. 1855. Charles C. BIGELOW. 1831. David RUPSON. 1856. Thomas PIERCE. Arnold HOLDEN. 1857. John L. MURPHY. 1832. Seth ALLEN. 1858. Jacob MULTER. 1833. William M. RICE. 1859. Ambrose UPSON. 1834. Norman B. CARTER. 1860. Geo. C. McKAY. 1835. David RUPSON. 1861. John L. MURPHY. 1836. Seth ALLEN. 1862. Jacob MULTER. 1837. William M. RICE. 1863. A. R. UPSON. Arnold HOLDEN. 1864. G. C. PARMENTER. 1839. John W. CROSBY. 1865. John L. MURPHY. 1840. Thomas PIERCE. 1866. Jacob MULTER. 1841. 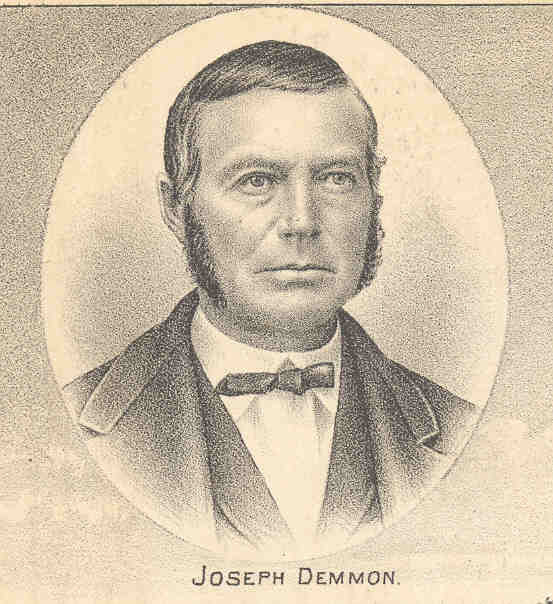 Joseph REMINGTON. Thomas PIERCE. 1842. Arnold HOLDEN. 1867. Paul H. WIEDRIG. 1843. Sylvester FITCH. 1868. Beta REMINGTON. 1844. Alexander SCOBEY. Chester J. LOWE. Charles C. BIGELOW. 1869. John L. MURPHY. 1845. Joseph REMINGTON. 1870. Jacob MULTER. 1846. Arnold HOLDEN. J. B. WEBER. Andrew STEVENS. 1871. Wm. PIERCE. 1847. Charles C. BIGELOW. 1872. P. S. ALDRICH. 1848. J. J. FRANK. 1873. J. L. MURPHY. 1849. Andrew STEVENS. 1874. L. C. ROBBINS. 1850. Arnold HOLDEN. 1875. Jacob MULTER. 1851. Charles C. BIGELOW. William PIERCE. 1852. Jacob J. FRANK. 1876. J. S. ALDRICH. 1853. Albert HOLLAND. 1877. J. E. HUMPHREY. 1854. Arnold HOLDEN. 1878. Jacob GUNTLER. The first school-house was erected, at Thomas' Corners, and one about the same time in the southwest part of the town, in the fall of 1822. Daniel THOMAS and Nelson B. CARTER being the first teachers. They were appointed the first commissioners in 1824, together with George ARNOLD. The town was divided by them into districts. They reported that year as received from the State treasurer $8.30, and from the collector of the town, the same amount. SCHOOL RECORDS OF ASHFORD, 1824. School districts and their bounds in the town of Ashford as divided by the undersigned, being school commissioners of said town for the year 1824. School district No. 1, beginning on the northwest corner of lot 70, thence eastwardly to the town line of Yorkshire; thence south to the south line of township 6, range 6; thence running west parallel with the first mentioned bounds; thence north to the first mentioned bounds of lot No. 70. School district No. 2, beginning at northeast corner of lot 74; thence west to the transit line; thence south to the line of Ellicottville; thence east to the town of Yorkshire; thence north to the 6th township, 6th range; thence west parallel with the lot 70 on the Cattaraugus Creek, on the 6th range; thence north to the first mention boundary of lot 1, in the town of Otto, on which Jacob HUFSTATER now lives. Dated at Ashford, this 18th day of September, 1824. There are at present in the town, as by statistics of 1878, 13 school districts, containing 13 school buildings valued, with sites, at $4705; volumes in library, 635, valued at $250; number of weeks taught in year ending Sept. 30, 1878, 374; number of teachers employed for 28 weeks or more, 13; amount of money paid for teachers' wages, $1872.63; number of children of school age, 604; average daily attendance, 251-85/100; amount of public money received from State, $1493; amount of money received from tax, $454.66. 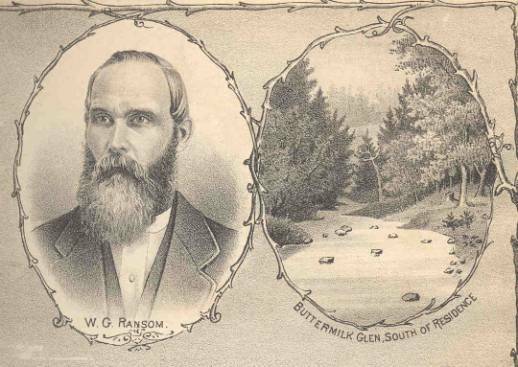 A young man by the name of Richard M. CORY, who had been preaching in Boston, Erie Co., started south on foot to find someplace to preach the gospel. After getting within about three miles of what is now Ashford Hollow, he came to forks in the road, and not knowing which way to go, he decided to leave it to the Lord in prayer, and accordingly knelt by the roadside. Some boys heard him, and ran home and told their father there was a man up the road down on the ground talking to somebody. The man went out and invited him into his house; and Mr. Augustus VAN SLYKE, for it was he, sent out for the neighbors, and a religious meeting was held. From this small beginning the First Free-Will Baptist Society of Ashford was organized. A meeting was called at the house of Henry FRANK, Oct. 27, 1821, signed by Alanson LOVELESS, Thomas JOHNSON, Anderson ROWLAND, Jacob HUFSTATER, and Augustus VAN SLYKE. An election of trustees was held, and David OYER, Jacob FRANK, and Isaac WOODRUFF were chosen. Meetings were held in private houses and school-houses until 1852, when a church edifice was erected, 38 by 50 feet, having a steeple, and at a cost of about $1400. A lot of 50 acres was deeded to the society, by the Holland Land Company, Sept. 1, 1828, as the first society organized in the town. This lot was exchanged, Feb. 20, 1857, to furnish means to complete the church and parsonage. The pastors have been the Revs. R. M. GARY, Chester CHAFFEE, Enoch JENKINS, ___ TANNER, ___ WEBB, ___ KELLOGG, A. W. ENSIGN, Joseph PARKYN, W. H. FLYNN, W. J. DURFEE, O. J. MOON, Rufus CORNELL, Alonzo P. COOK, Daniel McCOON, ___ HOWE; ___ HASLAN, H. CLANCEY, and Geo. DONAKER. The church has become disorganized, but the property is held by the trustees, and is used by the Church of the United Brethren. was organized in the fall of 1872, with 23 members, under the charge of the Rev. John SMITH, and E. M. HULL as leader. They hold their services in the Free-Will Baptist church, and now number 23, under the leadership of Rev. D. J. ANDREWS. A union Sunday-school is held in the church, and contains about 40 pupils; Jacob MULTER, superintendent. was organized about 1843. Asa ROWLAND and wife, Anderson ROWLAND and wife, Owen MAYBE and wife, and Elder O. TAYNTOR and wife were the first members. Rev. Orasmus TAYNTOR was a pastor of the Free-Will Baptist Church in Ashford, but disaffection in regard to church beliefs resulted, and this church was built up. A church edifice was built in 1851 on lot 62, and dedicated Jan. 6, 1852; and Rev. O. TAYNTOR was the first and only regular pastor for several years. In February, 1865, the church was destroyed by fire, but for several years previous the society had been on the decline, and is now disbanded or merged in the other denominations at this place. About 1844 an anti-slavery church was formed in the Weber neighborhood in New Ashford, composed of the families of WEBER, NORTON, GOO, LOWE, and others. Services were held in the school-house. That church has become disorganized. THE METHODIST EPISCOPAL CHURCH OF EAST ASHFORD. As early as 1832 the inhabitants of this neighborhood whose views were in accordance with the Methodist Church, gathered together at the school-house and organized a class. Ebenezer C. SHERMAN and the Rev. Mr. PROPER were among the first members, and Mr. PROPER was the first preacher. In 1855 a society was organized with 60 members, under the care of the Rev. C. B. CLARK, who became their first pastor. A church edifice was erected the next year at a cost of $1000. The pastors who succeeded Mr. CLARK were Geo. W. TERRY, ___ CURRY, H. BUTLER, Henry LATHAM, S. Y. HAMMOND, J. K. TORREY, Roswell CANFIELD, Charles EDDY, Wm. ROGERS, John REED, L. L. ROGERS, Wm. JENNINGS, L., WEBER, S. W. MERRIVALE, Delbert PARCELL, who is the present pastor. They number at present 44 members, and have a Sunday-school of 20 pupils, of which H. DAY is superintendent. In about 1845, owing to difference of opinion on slavery and masonry, a portion of the Methodists disconnected themselves from the Methodist Church of East Ashford, and organized a Wesleyan Methodist Church. They had no regular preaching, and in 1855 united with the Congregational and Baptist Churches in building an edifice for worship, and union services are held therein. was organized June 12, 1833, as a branch of the Springville Baptist Church, with 40 members; the Rev. Mr. LOOMIS conducting the services. Cyrus BELKNAP and wife, John WILSON and wife, Rufus TYLER and wife; and ___ MOORE were among the first members. Revs. O. TAYNTOR. and F. LANGMADE have ministered to this church. These are not numerous, and hold services in union with the Congregational and Wesleyan Methodists. THE GERMAN METHODIST EPISCOPAL CHURCH OF WEST VALLEY. As early as 1862 a number of Germans met together on the town line, between Ellicottville and Ashford, and organized a class, under the charge of Elder F. HOUCK, of the Erie Circuit. The first members were John SCHROEDER, Leader; Mr. and Mrs. G. NERDICH, Mrs. J. KOEHLER, Mrs. POLLOW, and John LINK. Services were usually held in the school-house. In 1869 the church was organized with 21 members, and in 1870 a church edifice was erected at a cost of about $2000. The pastors who have labored with this church are the Revs. F. HOUCK, C. F. SCHOEPFLIN, J. SCHAUFF, C. F. SCHOEPFLIN, A. UNHOLE, I. HARR, N. GELSLEIGHTER, C. F. WITT, J. H. DAMM, and J. G. SECHRIST, who is the present pastor. They number at present 48 members, with a Sunday-school containing 30 pupils, Christian EHMAN acting as superintendent. The services are conducted in German, and the church is called the Cattaraugus Mission. This society was organized in 1866, with 30 members, by the Rev. John BERNREUTHER, who was the first pastor. A church edifice was erected the same season at a cost of $2000. The pastors that have succeeded the Rev. Mr. BERNREUTHER are E. LEEMHERIS, M. HYER, and G. RADEMACHER, who is at present the pastor. They number about 70 members. PRESBYTERIAN CHURCH OF EAST ASHFORD. In the spring of 1832 a church was organized under the charge of the Rev. Wm. J. WILCOX, with 8 members, in the log school-house, where the red school-house now stands. Timothy STEVENS and wife, Ira KIDDER and wife, David R. UPSON and wife, Mrs. Mary TABER, and Mrs. Rufus TYLER were the constituent members. They were under the care of the Presbytery of Buffalo, Sept. 4, 1832, and in the spring of 1833 reported 14 members. No regular preaching was sustained, and in a few years the society became merged in others. CONGREGATIONAL CHURCH OF EAST ASHFORD. A number of the inhabitants of the place met at the East Ashford school-house, Feb. 10, 1854, for the purpose of organizing a Congregational Church. The Rev. C. B. LORD was chosen moderator. 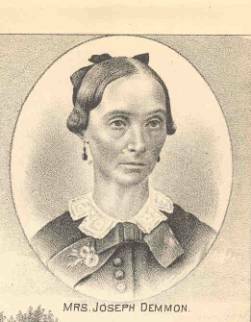 After due consideration they resolved to organize, and the constituent members were Tracy ENSWORTH and Harriet ENSWORTH, Elias HOPKINS and Laura HOPKINS, J. S. ALDRICH and Cordelia H. ALDRICH, Sulphina H. REMINGTON, Judson WILTZE, Alonzo HADLEY, Fessenden HADLEY, and Nelson HADLEY. The Rev. C. B. LORD remained as pastor for about two years, and was succeeded by the Revs. W. W. NORTON, L. F. LAUGMADE, Wm. HENRY, John JOHNSON, ___ PARKER, John A. WELLS, Wm. JENNINGS, and Frederick LONG. The present number of members is 50. A union Sunday-school contains 100 members. Harvey WILLIAMS is the superintendent. The church was built by the Congregational, Baptist, and Wesleyan Methodist Societies, in 1855, at a cost of about $1500. Repairs have since been put upon it of about the same amount. This church is an outgrowth of the Free-Will Baptist Church at Ashford Hollow, and was organized Jan. 5, 1873, by Rev. H. H. CLUNEY, who was its first pastor. The church edifice was erected the year of the organization, at a cost of $2500. In 1875 they reported 35 members. They are at present without a pastor. James WEST is very earnest in the interest of the church. was erected about 1861 on lot 46, near NEFF & GAMP's cheese-factory. It is under the charge of the Springville Church, and has connected with it about 30 families. There are four burial-places in the town. Ashford Cemetery is located in the village of Ashford, and contains the remains of many of the early settlers, Jeremiah BOSS being the first one buried there. The burial-ground of West Valley is located a little south of the centre of the village, near the school-house. The burial-place at East Ashford is situated east of the union church, on the hill. There is also a cemetery near L. WEBER's, in New Ashford. is situated in the southwest corner of the town, in the valley of the Connoirtoirauley Creek, and contains a church, hotel, post-office, school-house, three stores, feed-mill, sawmill, cabinet-shop, tin-shop, two wagon-shops, two blacksmith-shops, shoe-shop, harness-shop, and cooper-shop, and one physician. is situated in the southeast corner of the town, in the valley of the Buttermilk Creek, and contains two churches (Free-Will Baptist and German Methodist), dry-goods store, post-office, school-house, hardware- and tin-shop, clothing-store, feed-store and grocery, three blacksmith-shops, steam saw-mill, and tannery and saw-mill. This valley is from half to three-quarters of a mile in width, and for great variety of productions is said to excel any locality in the county. Much attention is given to the cultivation of apples, pears, peaches, and small fruits. Mr. George N. WEST has an orchard of 900 pear-trees, mostly standard, besides large apple-orchards. George N. WAIT has about 300 pear-trees. early known as Riceville is situated on Buttermilk Creek about two and a half miles north of West Valley, and contains two churches (Methodist and Union), post-office, store, school house, blacksmith shop, saw-mill. About a mile from this place. Eugene WILLIAMS has established a manufactory for ink that is said to be a superior article. The population of Ashford in 1825 was 275; in 1830, 631; in 1835, 1201. The town contains an area of 31,353 acres, of which 22,977 acres are improved. The soil in the northern part is a gravelly loam; in the southern, on the upland, it is a clayey loam; in the valleys, intermixed with gravel. Much attention is given to the culture of fruit, especially apples. There were raised 27,877 bushels in 1874. Of the cereals, oats are by far the most cultivated, and in that respect Ashford is the banner town of the county. The manufacture of butter and cheese is the principal occupation of the farmers, the latter being made mostly in factories, of which there are ten, as follows: The BIGELOW Factory, in the east part of the town, on Cattaraugus Creek, using the milk of about 400 cows; Joseph DEMMONS has two, one about two miles from Riceville, or East Ashford, with about 250 cows, the other at East Ashford, having in connection 300 cows; Joseph ULRICH, one at West Valley, with 500 cows, another on the road from Ashford to East Ashford, with about 200 cows; NEFF & GAMP have two, one at Ashford Hollow, having about 300 cows, the other with about 300 cows, and located about a mile and a half from Ashford Hollow, on the road to East Ashford; the.Ashford Central Union, located at "Dutch Settlement," and using the milk of 300 cows; the New Ashford Union, in the northwest part, with 250 cows; and the Franktown, owned by L. R. SMITH, with 175 cows. The milk of about 3000 cows is used, and about 900,000 pounds of cheese are annually made. was born in the town of Dummerston, Windham Co., Vt. He was the eldest of four children, __ two sons and two daughters. He being the eldest, and his father a cripple, the cares and duties of mature years and the responsibilities of manhood were thrown upon his shoulders while yet a mere boy. His opportunities for acquiring an education, owing to the lack of free schools and the limitations of poverty, were very poor indeed. At the age of twenty-one he was married to Miss Polly BIGELOW, of the town and county aforesaid. After attaining to his majority he went to Boston, and engaged with his uncle in stevedore business. After continuing in this business for some time, he engaged with a gentleman by the name of COBB as overseer of a gang of men then engaged in the construction of the locks of the Champlain Canal. While engaged in this capacity by the accidental and premature discharge of a heavy blast, was thrown across the canal amid timbers, dirt, and stones. He was picked up for dead; but life was not extinct; and good nursing and: a rugged constitution, together with the lapse of time, restored him to his original strength. After his return to health, his younger brother having left home, he returned to work his father's farm; but his mother being now dead, and his father again married, Daniel resolved to seek a home in the then wilderness of western New York. After a long and tiresome journey by stages and the Erie Canal, which was but recently opened, he arrived at the house of Job BIGELOW, in the town of Ashford, Cattaraugus Co., on the 26th of November, 1826. One incident of note we mention here, as showing the condition of the roads in that early period, and some of the incidents liable to occur while passing over them. While the wagon containing his family and goods was jolting from root to log, and from log to root, one of the children fell from the load and was plunged head foremost entirely beneath the ooze of one of the intervening sloughs. On arriving in this county with his wife and five children all the money left him was one lonely fifty-cent piece: The first thing to be done was to provide a shelter for his family. In pursuance of this object he left them at Job BIGELOW's and immediately commenced the construction of a log house upon a one-hundred-acre tract of land, -- which is the same he now owns, and which has been his home for fifty-two years. The house was built of logs, chinked with basswood split out for that purpose, and the crevices calked with moss gathered from logs in the adjoining woods. This latter work was done by the wife and children. The floors were made of basswood split in slabs for that purpose, spotted on the underside to lay level on the joists, and then adzed off on top. This work was speedily accomplished, and the winter of 1826-27 was passed in their own house in the wilderness of Cattaraugus. It may be a subject of some wonderment to the reader of this biography how he sustained his family without money. The mystery is easily explained. Mr. COLE was a good carpenter and joiner, while along the Cattaraugus Creek there lived at this period a number of settlers from the Mohawk, who had settled there during the intervening years since the war of 1812. These people cleared the bottom lands along that stream, and improved them until at the period of which we write they had abundance of grain, which they were both willing and anxious to exchange for work in erecting buildings, of which they stood in great need. His knowledge of this branch of industry was the means of providing the necessary support of the family, until his own land could be made to produce to that end. We now pass over a few years in which nothing particular occurred, beyond the felling of the forests and clearing of land, interspersed with the accidental killing of an only cow and the sickness and death of one of the oxen composing his team, until the time when sickness and death enters the family and removes the wife and mother, who died of typhus fever, on the 22d day of September, 1834. Left alone with a family of nine children in the then but little better than a wilderness, the thousand-and-one wants of such a family without a mother's hand to guide, together with the wastes and losses which are too apt to be the rule in a family where each and all are acting without a head to direct or a hand to guide, as was the case with this, the father being obliged to be absent from home a large share of the time earning money to support his family, while the farm and its management, to a large extent, was left in the hands of the oldest boy; all these conspired to make life and its surroundings look dark, indeed. On Dec. 26,1835, he was again married to a sister of his first wife, Miss Nancy BIGELOW; but a brief period elapsed before death again entered the home and removed the wife and mother, who died of consumption on the 23d day of May, 1838. Again left alone with ten children he struggled against time and tide, with the buffetings of fortune and the chilling touch of an unfriendly world for five years, when he was again married to Miss Polly BEMIS, June 18, 1843. At the date of this last marriage we find his family somewhat scattered; the four oldest children, all boys, had left home, and in various capacities were working their way through the world, while his financial prospects looked dark, indeed. He had been unable thus far to keep the interest paid on his land indebtedness. He had been for a long time himself laid up by a blow of a broadaxe; the necessary attendance of a physician upon himself and family during so much sickness, with loss of time and debts contracted for living and funeral expenses, conspired to make him financially worse off than nothing. But with his third marriage came a few hundred dollars in cash and a hand to guide the household affairs, and a will to surmount all obstacles; debts began to lessen, and with the increased products of the farm, with an occasional job at his trade, the next decade turned the dollar to balance in his favor; since which time he steadily increased in wealth until now, though not rich in the world's estimation, yet he is above want and able to enjoy the comforts, if not the luxuries, of life. During all his sojourn of fifty-two years, since first settling in this county, he has borne a responsible part in all the affairs of his town, especially in laying out new roads and constructing bridges, until the infirmities of age compelled him to relinquish not only public but private matters, and resign all into hands more able to bear them. And now eighty-four years old, crippled with rheumatism, and bent with years, he is only waiting till the shadows are a little longer grown. His children are all living, except one, who was murdered by the Indians in Minnesota in 1862. Among his surviving children are found one doctor, one lawyer, one minister, one blacksmith, one sailor, and one carpenter; the others are engaged in agricultural pursuits.